In the age of the McMansion, it’s hard to believe that, as recently as 1950, Americans were living small. The average home size then was 983 square feet. Today, despite smaller family sizes, the average is closer to 2400. But the recent “tiny house” movement is taking folks back to a simpler time. For environmental, economic and philosophical reasons, people across the country are downsizing to homes as small as 100 to 1000 square feet. The key to living smaller?Living smarter. 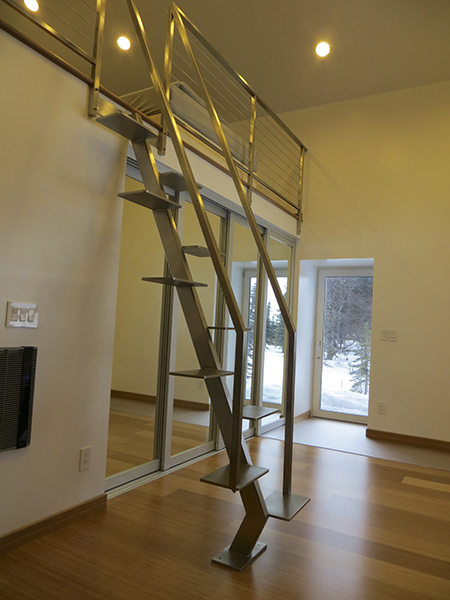 “You may not have the square footage, but you can still live comfortably if you think about space in the right way,” explains Angela Pekich of Alaska Premier Closets. She and co-owner Luis Suarez specialize in space. 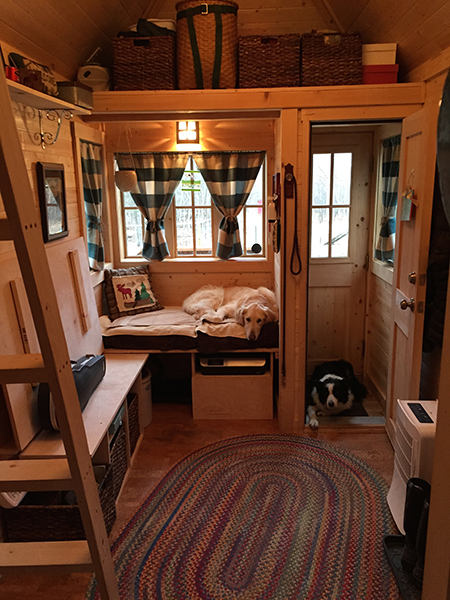 When they learned about the tiny house movement, they immediately recognized how the tricks of their trade could help homeowners learn to live small. In their showroom, the couple has designed an “under 100-square-foot space” that highlights the design features that make a small space livable. Slot walls with interchangeable baskets, hooks and shelves create a storage space that’s quickly transformed to meet any need, while nesting tables occupy minimum space when not in use. Luis demonstrates how flip-up countertops can be used as a table, desk or entertainment center, then folded out of the way, as can Murphy beds. Small appliances work just as well as large ones but take up a fraction of the space. 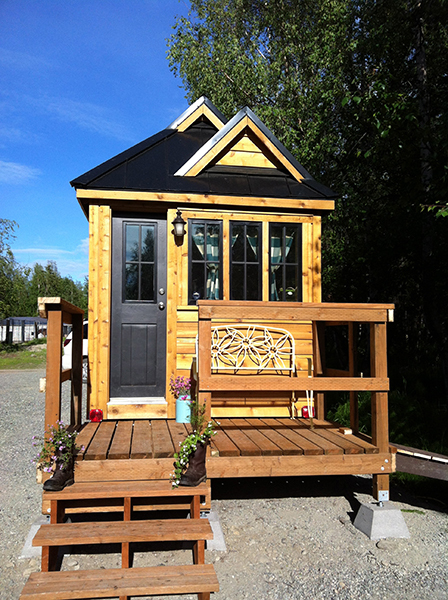 When Heather Adams, of Wasilla, needed a new home in 2013, she decided to go small – really small. 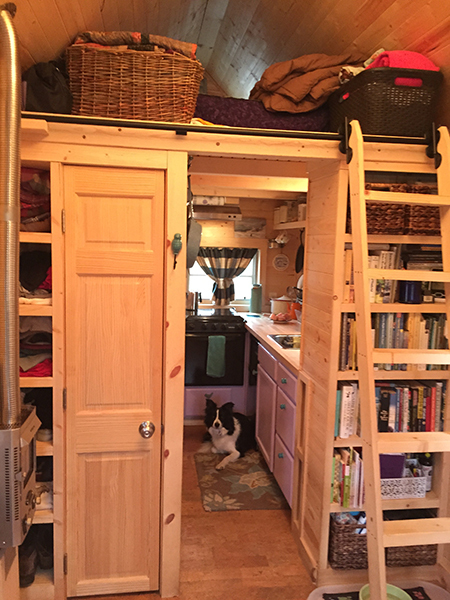 She ordered a 160-square-foot ready-made house from Tumbleweed, which bills itself as the “tiny house company.” With a small sleeping loft and a ground floor that’s 130 square feet, Heather maximizes her space with a composting toilet, an Envi panel space heater and a small propane heater, a Panda compact washing machine, Ikea hooks and baskets for organization – and a willingness to purge. “I got rid of a lot of stuff,” Heather says. “For the most part, it was extremely freeing; stuff can be such a burden.” Less stuff – and less square footage – has cut down on the hours she used to spend cleaning her 2300 square foot home. Now Heather spends more time hiking and enjoying the outdoors year-round. 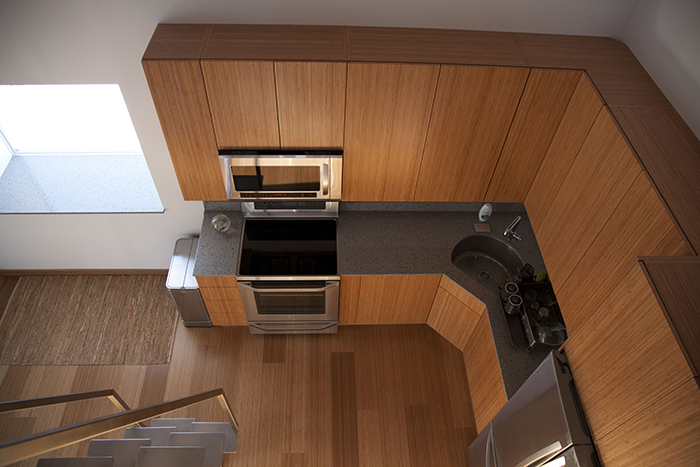 For many, tiny living is the embodiment of a less-is-more philosophy. But Heather had practical reasons for living small. “Debt is a huge problem in our society,” she explains. “You rack up student loans, then you get a job to pay for that. You buy a house and a car, and you’re a slave to your job until you retire.” But with her low heating bill and no mortgage, Heather plans to be debt-free within seven years. “I’m looking forward to that freedom,” she says. People aren’t being nosy when they ask Tom Marsik and Kristin Donaldson of Dillingham what their heating bill was last year; they’re honestly curious how much it costs to heat a 600-square-foot home. Tom’s answer? “About $150 for the entire year.” The couple’s total energy cost was roughly $700, around 15 percent of the average Dillingham home. But when the couple built their small house, they set out to save more than money. They wanted to reduce their carbon footprint, and so they designed and built what is now known as the “world’s tightest” house. With 28-inch thick walls, cellulose and fiberglass insulation, a heat recovery ventilator and triple-pane, argon-filled, low-e windows, only 24 percent of the home’s heat comes from its heating system; insulation keeps heat from other sources, like electric appliances and even body heat, indoors. “Some people think they’ll be sacrificing something by living in a small house, but I think it can be the other way, actually,” says Tom. Like Heather, he points out that less cleaning means more time for the important things, like playing with his 9-month-old daughter. The couple has made efficient use of their space with an open-floor concept, cathedral ceiling, living space on the second floor, movable walls and multi-use rooms. Both Tom and Kristin realize tiny living isn’t for everyone, but they hope the efficiency and comfort of their beautiful small home can be inspiration for others.